With the summer season kicking off, asparagus is plentiful at the markets, and is one of my favorite veggies. So I’m always on the lookout for delicious new Weight Watchers Asparagus Recipes to try, since I eat a lot of asparagus and love to shake up my plate with some new and unique ideas. This Balsamic Tomato Asparagus was off the charts AMAZING. The mild asparagus was a perfect palate for the creamy, tangy goat cheese and tart, acidic tomatoes. And at just 3 Points for half the entire dish, this asparagus makes a great Weight Watchers side dish recipe that’s as delicious as it is beautiful. My husband loved it just as much as I did. I also loved how ridiculously easy it was to make. This recipe would also be fantastic using grilled asparagus too, so if you’ve got that grill heated up, toss on some asparagus and make this dish, asap! 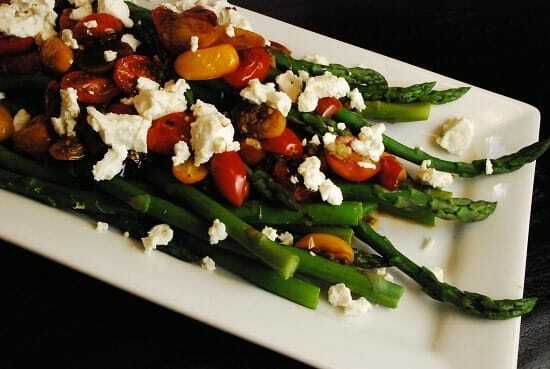 A delicious and unique side dish recipe, this Balsamic Tomato Asparagus dish is incredibly flavorful and just 3 Points per serving. With it’s gorgeous colors and bold flavors, it offers a wonderfully fresh way to prepare asparagus. Spray a large skillet with an olive oil mister and set over medium-high heat. Add tomatoes and garlic; cook 5 minutes. Stir in vinegar; cook 3 minutes. Stir in salt. This dish was amazing! I can’t wait to make it again. I’m going to try this recipe using fresh green beans. We’re not asparagus fans but the ingredients should work with green beans too. Thanks for this wonderful site.